With the many foreclosures currently occurring, professional maid service in Atlanta just released discount dates for its move-out cleaning specials for homeowners experiencing foreclosures. We hope that this cleaning special will help make life a little easier for people moving out of their homes as a result of foreclosures. On February 20th, Atlanta professional maid service released discount assistance dates and times on its website for homeowners experiencing foreclosure stress. EMJ Cleaning provides a variety of residential and commercial cleaning services to its clients in Atlanta and neighboring cities. With the number of foreclosures recently skyrocketing, the owner of EMJ decided that it would be holding move-out cleaning specials to lighten the load of discouraged homeowners; these foreclosure and move-out cleaning services will be valued at the most affordable rates in EMJ Cleaning history. EMJ’s foreclosure and move-out cleaning services entail the following: cleaning baseboards, vacuuming carpeted areas, vacuuming and mopping hardwood floors, cleaning window frames and doors, cleaning blinds and fan lights, removing all spider webs, cleaning cabinets, removing all trash, scrubbing toilets, bathtubs, showers and sinks, wiping down countertops, stovetops and other kitchen appliances and more. Right now, EMJ’s foreclosure and move-out cleaning specials include cleaning any one bedroom, one floor and one bathroom homes for only $80.00. “We hope that this cleaning special will help make life a little easier for people moving out of their homes as a result of foreclosures,” states Cano. 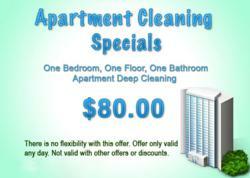 EMJ Cleaning has been providing a variety of professional maid services in Atlanta for over 10 years. In addition to these foreclosure and move-out cleaning services, EMJ also provides regular cleaning, heavy duty cleaning, deep cleaning, window cleaning and carpet cleaning. EMJ’s exceptionally trained and professional staff utilizes quality products, such as Pine Sol, Clorox and Soft Scrub, for every single job. Free estimates are provided as well as $10 discounts for first-time customers. If you’re interested in more information about EMJ’s foreclosure and move-out cleaning specials, call 678-966-9469 or visit the website at emjcleaning.com.